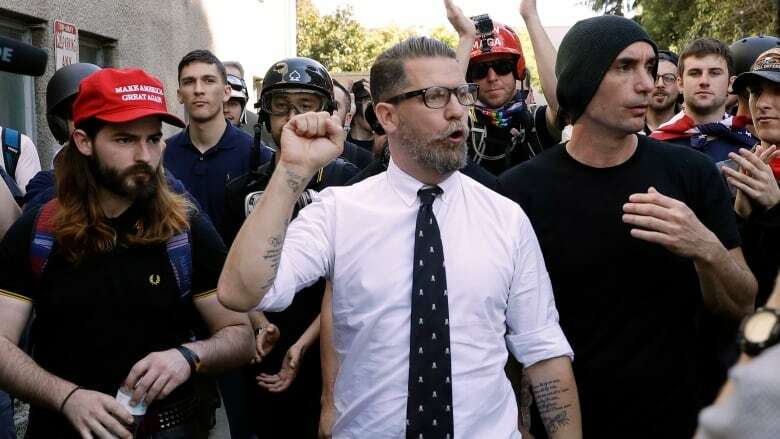 The far-right group the Proud Boys and its founder, Gavin McInnes, have been banned from Facebook and Instagram because of policies against hate groups. The move follows the arrest of several people after Proud Boy members clashed with anti-fascist protesters in Manhattan on Oct. 12, following a speech by McInnes. McInnes called the ban censorship in an email Wednesday. He said "the left" is "ramping up the hysteria with fake news" ahead of next week's U.S. midterm elections. The Southern Poverty Law Centre (SPLC) describes the all-male organization as a hate group. The Proud Boys refer to themselves as "Western chauvinists." Their mottos include: "West is best," "Glorify the entrepreneur," "Venerate the housewife" and "I won't apologize for creating the modern world." A spokeswoman for Facebook, which also owns Instagram, said in a statement that the company bans content from hate groups "when we become aware of it." Last year, five members of the Canadian Forces who said they were members of the Proud Boys were removed from duties and training after they disrupted a Mi'kmaw ceremony on Canada Day. Four of the five resumed their duties under probation at the end of Aug. 2017. The fifth member left the Forces of his own accord. No charges were laid against them. The loss of the platforms will likely hurt the Proud Boys' ability to recruit. The SPLC reported in August that regional Proud Boys chapters were vetting new members through private Facebook chat rooms. Asked Wednesday if the social media platforms have been a major recruiting tool, McInnes said, "I guess." McInnes, 48, is a co-founder of Vice Media but left the company in 2008. He now also hosts a podcast called Get Off My Lawn. Who are the Proud Boys who disrupted an Indigenous event on Canada Day?